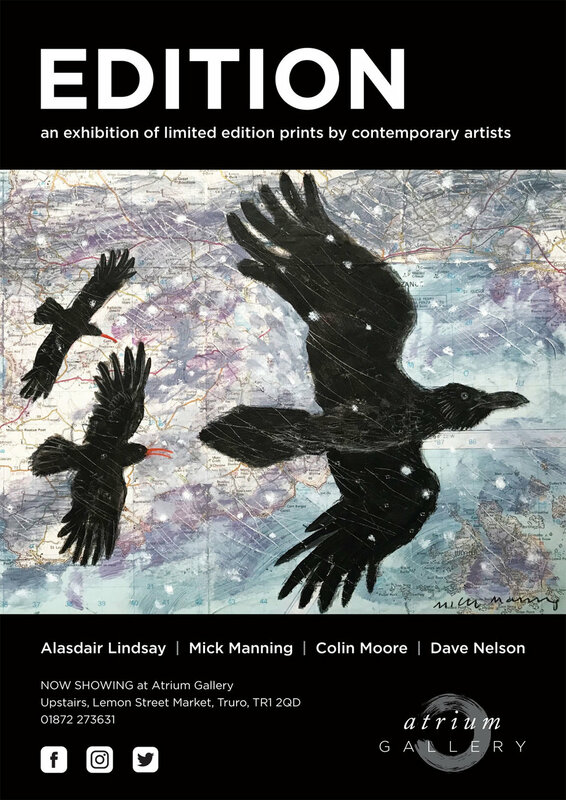 EDITION is the current print show at Atrium Gallery Truro (upstairs at Lemon Street Market) featuring limited edition prints from hugely talented artists Colin Moore, Dave Nelson, Alasdair Lindsay and Mick Manning. The Atrium Gallery is open from 9am - 5pm Monday to Saturday and entry is free. When it's a Wednesday night in December, that can only mean one thing! Come into Lemon Street Market to finish (or start) your Christmas shopping. The mood will be festive and the refreshments from Fig Cafe will be tasty and seasonal. You can even get a Christmas Hair Cut at Lemonheads. Open till late Wednesday night! Atrium Gallery's latest exhibition is showcasing those artists who document and create 'come rain or shine' and in a variety of media. The show reflects the inspiration that artists take from their immediate surroundings. As well as paintings, there are sketchbooks and ceramics. The books are an artist’s record and journaling studies and the artist Sue Lewington hopes that visitors will hold and read them - and be inspired to journal themselves. The result is a contemporary yet timeless show that explores the changes of weather daily and throughout the year. Artists include Imogen Bone, Colin Moore and Mark Beresford. Inception is an exciting contemporary art exhibition exploring abstract painting, ceramics and jewellery design by artists and makers practising locally and across the UK. Artists include Dan Bassett, Sophie Capron, Charlotte Cornish, Ashley Hanson, Amy Lanyon, MAMM + MYRGH Goldsmiths, Sue Peck, Nicola Shelton, Christopher Tate, Ali Tomlin, Angeline Tournier and Simon Williams.